Stage 3 coming on January 1, 2011! 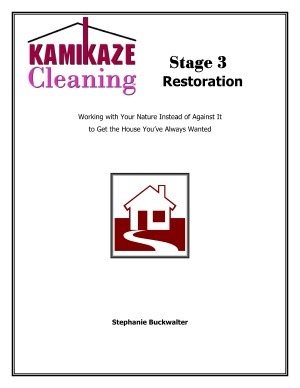 The last book of the Kamikaze Cleaning series is here. Finally fulfill that vow to get your house in order once and for all. Have you ever wondered why housekeeping is such a challenge for you? Why some areas of the house never seem to get organized? It may be because you are a right-brained homemaker trying to meet left-brained standards. What difference does your brain make, you ask? It is the difference between strife and contentment, between tolerating housework and embracing it. It is the difference between disorganization and finding what you want when you want it. In short, it’s the difference between force-fitting a style of home management or working with your natural tendencies in the areas of scheduling and organization. Don’t get me wrong, there’s still work to be done. The work doesn’t go away, but when you recognize the cause of your struggles, you’re more than half way to the solution. The nice part is that Kamikaze Cleaning Stage 3 takes you all the way home. You will not be left hanging. For example, can you see yourself in any of these scenarios? You spend hours, maybe even days preparing a housekeeping plan that you know will work beautifully but you never follow through with it—at least not for more than a week or so? Do you see the many possibilities for your collections of stuff—even if they don’t have a purpose right now? Do you delight in creating the perfect filing system with each category full of meaning—only to find that when it comes time to file you can think of three different categories you might have identified for the piece of paper in your hand? Do you leave stuff out in piles so you will remember to act on it—only to cover it up with a newer pile until the pile becomes a blind spot? Are you a free spirit who plans to finally get the house in order—but then loses the urge when something more interesting pops up on the horizon? Do you make a tight schedule, then flit from task to task—to the point where you behave as a jack-of-all-trades, but are master of none? Do you find it difficult to pass things along—even though your life has changed to the point where you know you’ll no longer need them? Do you balk at cleaning and organizing your home—unless you have large chunks of time reserved to do it? Each of these questions is answered in its own chapter. In addition, there is detailed information on how to approach house-cleaning in a way that works for you. There is even one chapter that analyzes housekeeping by the numbers: what does it really take to get a house clean from a scientific point of view?